Is chondroitin sulfate responsible for the biological effects attributed to the GC protein-derived Macrophage Activating Factor (GcMAF)? We hypothesize that a plasma glycosaminoglycan, chondroitin sulfate, may be responsible for the biological and clinical effects attributed to the Gc protein-derived Macrophage Activating Factor (GcMAF), a protein that is extracted from human blood. Thus, Gc protein binds chondroitin sulfate on the cell surface and such an interaction may occur also in blood, colostrum and milk. This interpretation would solve the inconsistencies encountered in explaining the effects of GcMAF in vitro and in vivo. According to our model, the Gc protein or the GcMAF bind to chondroitin sulfate both on the cell surface and in bodily fluids, and the resulting multimolecular complexes, under the form of oligomers trigger a transmembrane signal or, alternatively, are internalized and convey the signal directly to the nucleus thus eliciting the diverse biological effects observed for both GcMAF and chondroitin sulfate. The group-specific component (Gc) protein-derived Macrophage Activating Factor (GcMAF), a protein that is extracted from human blood, has received a great deal of attention in the past few years because of its proposed therapeutic use in the immunotherapy of cancer and other diseases ranging from autism and AIDS to multiple sclerosis and lupus , , , , , , , , , . GcMAF derives from the Gc protein, also know as vitamin D binding protein, a carrier protein highly represented in plasma, and, in lower concentration, in colostrum and milk. The Gc protein was first described in 1959 and it is endowed with multiple functions . The role of the Gc protein as precursor of the GcMAF, however, was described only in 1995, when it was postulated that reduced conversion of the Gc protein into the active GcMAF was associated with immunosuppression in AIDS patients . In this paper, it was hypothesized that the conversion of the Gc protein into the GcMAF occurred via deglycosylation at the level of the Threonine in position 420 of the Gc protein. In particular, it was hypothesized that the Gc protein could be selectively deglycosylated by beta-galactosidase of stimulated B lymphocytes, and by sialidase of T lymphocytes. 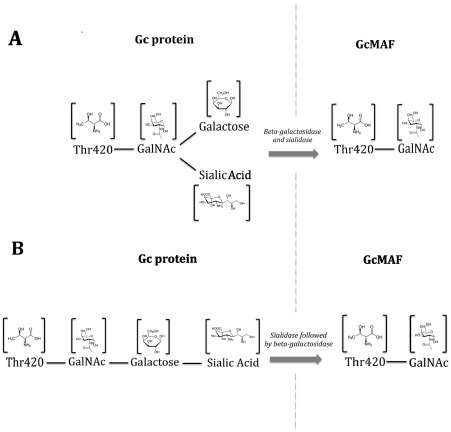 Removal of Galactose and Sialic Acid would convert the Gc protein into the active GcMAF, that is nothing else than a Gc protein with only N-acetylgalactosamine (GalNAc) as the remaining sugar moiety covalently attached to Threonine 420 . It was later demonstrated that the three sugar moieties attached to Threonine 420 are indeed arranged in a linear fashion with GalNAccovalently bound to Threonine, and Galactose and Sialic Acid attached to the GalNAc in this order (Fig. 1). Thus, the resulting linear trisaccharide is arranged as GalNAc-Galactose-Sialic Acid . Fig. 1. Proposed structures of Gc protein and GcMAF. Panel A: Structure proposed by Yamamoto et al. in 2005 . According to this early model, N-acetylgalactosamine (GalNAc) is covalently bound to Threonine (Thr) 420 of the Gc protein. Galactose and Sialic Acid are bound to GalNAc in a Y-branched arrangement; therefore, according to this model, the sequence of deglycosylation by the enzymes beta-galactosidase and sialidase is not critical for the preparation of GcMAF and treatment of Gc protein with immobilized beta-galactosidase may precede treatment with sialidase . 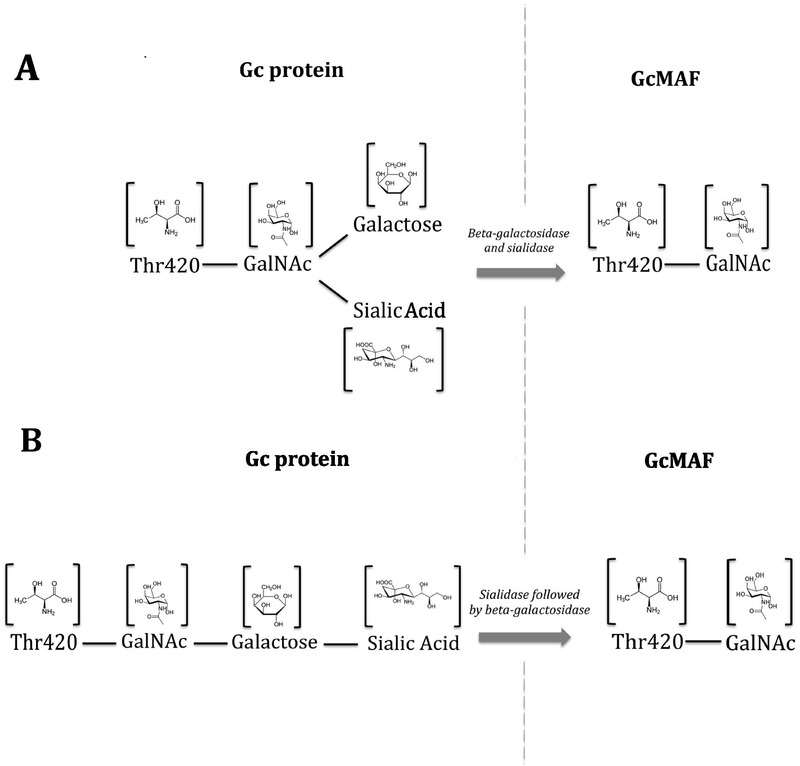 Removal of Galactose and Sialic Acid exposes the GalNAc moiety and leads to the formation of GcMAF. Panel B: Structure proposed by Ravnsborg et al. in 2010 . According to this model the three sugar moieties attached to Threonine 420 are arranged in a linear fashion with GalNAc covalently bound to Threonine, and Galactose and Sialic Acid attached to the GalNAc in this order. At variance with the early model, the linear arrangement of the three sugar moieties was confirmed by mass spectrometry. According to the results reported by Ravnsborg et al. , treatment with sialidase must precede treatment with beta-galactosidase; if the Gc protein is treated only with beta-galactosidase, GalNAc would remain “covered” by the other two sugars and no GcMAF would be formed. Three types of observation led to propose a critical role for the GalNAc moiety attached to Threonine 420, lending credit to the hypothesis that GalNAc was responsible for the binding to the putative receptor and/or for the activation of macrophages and, hence, for the observed immune stimulating and anticancereffects. When the GalNAc is not exposed, as it is in the Gc protein because it is “covered” by the two other sugars (i.e. Galactose and Sialic Acid), the Gc protein is not endowed with macrophage stimulating activity . Small synthetic peptides comprising and exposing the GalNAc moiety exerted in vitro the same effect of the full-length GcMAF . When the GalNAc is removed from the Threonine 420 by action of the enzyme alpha-N-acetylgalactosaminidase (nagalase), the Gc protein could not be converted to the active GcMAF, and it was postulated that such a lack of conversion led to immunodeficiency , . As a logical consequence deriving from this latter point, it was hypothesized that elevated serum levels of nagalase would prevent the formation of GcMAF from the Gc protein, and measure of nagalase was proposed as a method to assess relative immunodeficiency due to deficient production of GcMAF in patients with AIDS, cancer, systemic lupus erythematosus, or autism , , , , , . Since the serum nagalase seems to be an endo-nagalase and does not act as an exo-enzyme under colloidal serum environment, it was postulated that the administration of exogenous GcMAF extracted from the blood of healthy individuals to patients with elevated nagalase, would restore macrophage activity . According to this hypothesis, exogenously administered GcMAF was not to be affected by the patient’s serum nagalase , bypassed the inactive Gc protein devoid of the GalNAc moiety because of the nagalase, and directly acted on macrophages for an extensive activation. This theory led numerous research groups to study the effects of exogenously administered GcMAF in vitro and in vivo with very encouraging results. In most studies, the Gc protein was extracted from human blood using 25-hydroxyvitamin D affinity chromatography, and then it was treated enzymatically with beta-galactosidase and sialidase in order to expose the GalNAc moiety and thus to convert it into the active GcMAF (for exemplificative reference on the extraction procedure and the subsequent enzymatic conversion of the Gc protein into GcMAF, please see references: , , . In some clinical studies, the passage involving vitamin D affinity chromatography was skipped, and GcMAF was prepared by enzymatic treatment of human serum without purification by vitamin D affinity chromatography . Exogenously administered GcMAF, thus proved effective in inhibiting the proliferation of human prostate and breast cancer cells in vitro, . Consistent with the results observed in cell cultures, GcMAF extracted from human blood inhibited angiogenesis and tumor growth in the experimental animal , , , . It is interesting to notice that human blood-derived GcMAF appeared to work in animals, thus lending credit to the hypothesis that its effects on macrophages, tumor growth and angiogenesis were not specie-specific. The clinical results of GcMAF-based immunotherapy, however, have been the object of intense scrutiny and some of the papers reporting such results have been questioned , , , with the consequent withdrawal of three papers from the same research group that had reported very encouraging clinical results in HIV and cancer patients , , . It should be noticed, however, that the retraction of these three papers was due to “irregularities in the documentation for institutional review board approval” and not to questions concerning the validity of the clinical observations. Thus, despite such concerns, the clinical efficacy of GcMAF-based immunotherapy has been independently confirmed by other research groups that have published clinical observations that seem to indicate that human blood-derived GcMAF is indeed effective in the immunotherapy of cancer , , , , , autism , and a miscellanea of other conditions associated with immune system dysfunction . According to a recent paper, “By March 2014, Saisei Mirai (a clinic in Japan specialized in immunotherapy with human blood-derived GcMAF, non purified by vitamin D-binding chromatography) will have treated more than 1000 patients with GcMAF, both with and without conventional therapies, proving its safety as a therapy” . In sum, in the past 20 years, solid evidence has accumulated demonstrating that GcMAF, extracted from human blood, inhibits cancer cell proliferation in vitro, angiogenesis and tumor growth in the experimental animal, and may have a role in the immunotherapy of a variety of conditions. In addition, we recently demonstrated that human blood-derived GcMAF may also have a role in reducing the damage inflicted by chemotherapy in neurons and glial cells in vitro, , thus proposing an additional role for GcMAF in counteracting some of the side effects of conventional chemotherapy of cancer. Despite the encouraging evidences concerning the effectiveness of human blood-derived GcMAF, there are significant inconsistencies at the molecular and clinical level that force us to question the interpretation of the results reported above, which include our own results, and to propose a novel hypothesis that may help solving such inconsistencies. One of the most striking inconsistencies concerns the cancer risk in individuals harboring the Gc2 allele only (Gc2 homozygotes) of the Gc protein. These individuals are unable to glycosylate the Gc protein on Threonine 420 due to its substitution by lysine. Thus, there is no GalNAc in position 420. In other words, Gc2 homozygotes are unable to produce one single molecule of GcMAF but, despite this fact, the risk of cancer in these individuals is decreased rather than increased as one would have expected given the absence of bona fide GcMAF . It should be noticed that this inconsistency refers to breast cancer that is one of the types of cancer where GcMAF had proven effective in vitro, , and in vivo. From this observation it appears that the presence or the absence of GalNAc in position 420 of the Gc protein is rather irrelevant in determining immune competency and/or cancer risk, and this observation is clearly at odds with the proposed critical role of GalNAc and, consequently, of nagalase, the enzyme that, by removing GalNAc, would prevent the conversion of the Gc protein into the active GcMAF. It should be noticed, however, that the risk to develop breast cancer is not associated with one single factor and, therefore, it would be too simplistic to assume that the absence of bona fide GcMAF is responsible for the observed decrease risk of breast cancer in Gc2 homozygotes. Nevertheless, this observation leads to question the proposed role for GalNAc in position 420 of the Gc protein as far as breast cancer risk is concerned. Another observation by a research group that has published several papers on GcMAF, further questions such a critical role for the GalNAc moiety. In a paper published in 2013, the Authors demonstrated that removal of the Galactose, but not of the Sialic Acid, by beta-galactosidase alone, was sufficient to confer antitumor activity to the Gc protein with a potency comparable to that of GcMAF . It is worth noticing that treatment of the Gc protein with beta-galactosidase alone does not lead to the formation of GcMAF and, on the contrary, leaves the molecular structure of the Gc protein unaltered as demonstrated by Ravnsborg et al. in 2010 . In this study, the Authors used mass spectrometry to demonstrate that treatment of Gc protein with beta-galactosidase alone did not change the glycosylation status of the Gc protein. In other words, the Authors demonstrated that, in order to remove the Sialic Acid and the Galactose and, therefore, to expose the GalNAc, treatment with sialidase must precede treatment with beta-galactosidase. If the Gc protein is treated only with beta-galactosidase, GalNAc would remain “covered” by the other two sugars and, therefore, not available for binding. It is therefore possible that the anti-tumor activity described by Hirota et al. may be ascribed to the Gc protein itself or to its association with chondroitin sulfate as we shall propose in the following paragraphs. Another inconsistency refers to the amount of endogenous GcMAF that, at variance with what had been hypothesized, is not decreased in cancer patients, and it actually is much higher than the amount of exogenous GcMAF that has been administered in the immunotherapy of cancer as demonstrated by Rehder et al. in 2008 . In this paper, the Authors examined the glycosylation status of the Gc protein in 56 patients with breast, colorectal, pancreatic, and prostate cancer (i.e. those cancers that had been successfully treated with GcMAF), and observed that there was no significant depletion of GcMAF in the 56 cancer patients examined relative to healthy controls. This observation clearly disproves the theory that cancer patients have decreased production of endogenous GcMAF because of elevated nagalase and, therefore, the entire rational for treating patients with exogenous GcMAF appears to be flawed. Such an inconsistency concerning the role of nagalase, is further corroborated by the observation that autistic children may show levels of serum nagalase higher than those of HIV or cancer patients but, nevertheless, show no signs of immunodeficiency , , . In order to solve the inconsistencies described above, we reconsidered the molecular structure of GcMAF and its mode of action. In fact, despite the wealth of information on this molecule, the details of its interaction with specific, or non-specific, cellular receptors are still missing. It is worth noticing that a receptor for GcMAF has never been described in molecular detail. However, several years ago, it was demonstrated that the Gc protein binds to a variety of cells that include cells of the immune system, possibly influencing their function. In 1999, DiMartino and Kew studied the interaction of the Gc protein with the cellular membrane of neutrophils and demonstrated that the Gc protein did not bind to a specific cellular receptor, but formed oligomers and interacted with a chondroitin sulfate proteoglycan on the cell surface . According to these Authors, large heterogenous macromolecules, such as cell surface proteoglycans containing chondroitin sulfate, would certainly explain the unusual cell-binding characteristics of the Gc protein. It did not escape our attention that chondroitin sulfate is composed of a chain of alternating sugars that are GalNAcand glucuronic acid. According to the molecular model that may be derived from such an observation, several molecules of Gc protein would be assembled as oligomers thanks to their binding to the chondroitin sulfate that is present in the extracellular matrixsurrounding the cellular membrane. It is conceivable that the assembly of oligomers of Gc protein may trigger a transmembrane cell signaling mechanism. This mode of action would be analogous to that described for the epidermal- or the platelet-derived growth factors that have to oligomerize in order to trigger their specific signals , . The formation of such a multimolecular complex comprising oligomers of the Gc protein and chondroitin sulfate, that is inherently rich in GalNAc, might help explaining the paradoxes and inconsistencies reported in the preceding paragraph. The observation that the Gc protein binds to chondroitin sulfate, also supports the hypothesis that such a binding between Gc protein (or GcMAF) and chondroitin sulfate may occur also in serum, colostrum or milk, i.e. in fluids where both the Gc protein and chondroitin sulfate are present in relatively high amount , , . Therefore, since the Gc protein used in the studies in vitro and in vivo to produce GcMAF was extracted from human blood using vitamin D affinity chromatography(and in certain cases even without such a step), and no other purification step was performed (i.e. a step using chondroitinases that would have removed chondroitin sulfate), it is almost certain that chondroitin sulfate remained associated with the Gc protein when it was extracted from human blood and, therefore, with the GcMAF that was enzymatically produced from the Gc protein. In fact, in human plasma, the Gc protein is present in fraction IV of Cohn-Oncley fractionation , and we demonstrated that chondroitin sulfates (i.e. chondroitin sulfate A, B and C) are highly represented in this very Cohn-Oncley fraction , thus making the interaction between the Gc protein and chondroitin sulfate highly probable if not certain. Interestingly, chondroitin sulfate shows all the biological and clinical features that have been attributed to GcMAF. In fact, chondroitin sulfate activates macrophages and induces the synthesis and release of nitric oxide in a manner superimposable to that described for GcMAF , . In analogy with the reported effects of GcMAF, activation of macrophages by chondroitin sulfate is not accompanied by the release of pro-inflammatory cytokines or Prostaglandin E2, further highlighting its role as an immune modulator with no pro-inflammatory activity. Activation of macrophages by chondroitin sulfate may occur also through the modulation of the signaling pertinent to the Macrophage Colony Stimulating Factor (CSF-1) . In other words, chondroitin sulfate appears to be involved in the activation of macrophages not only when such an activation is exerted by GcMAF, but also when other macrophage activators are involved. In addition to the activation of macrophages, chondroitin sulfate exhibits most of, if not all, the other effects attributed to GcMAF in vitro and in vivo. For example, it inhibits mitogenic signaling in human breast cancer cells , and it shows antitumor activity when administered alone or in combination with known chemotherapeutic agents . Consistent with these observations in vitro, the efficacy of chondroitin sulfate in the treatment of a variety of diseases associated with dysregulation of the immune system is well proven. Experimental and clinical data suggest that chondroitin sulfate might be a useful therapeutic agent in diseases as diverse as osteoarthritis, psoriasis, inflammatory bowel diseases, atherosclerosis, Parkinson’s and Alzheimer’s diseases, multiple sclerosis, amyotrophic lateral sclerosis, rheumatoid arthritis and systemic lupus erythematosus, i.e. many of the conditions that have been reported to respond to GcMAF treatment . Moreover, in analogy with GcMAF, chondroitin sulfate has been reported to be effective in HIV infection since 1998, when it was demonstrated that sulfated polysaccharides such as chondroitin sulfate, are potent inhibitors of HIV . Further stressing the role of chondroitin sulfate as an immune stimulant agent with effects superimposable to those reported for GcMAF, in 1999 Di Caro et al. demonstrated that sulfated glycosaminoglycans were effective not only against HIV-1, but also against herpes simplex virus type 1 and human cytomegalovirus, two agents responsible for opportunistic infections in HIV-infected people. The Authors concluded that: “In view of the absence of the side-effects typical of heparin-like compounds, a combination of these derivatives could have therapeutic potential” . Furthermore, chondroitin sulfate, but not other glycosaminoglycans, appears to specifically inhibit the binding of HIV glycoprotein gp120 to its host cell CD4 receptor, thus emphasizing the potential for chondroitin sulfate as an anti-HIV remedy . Also the neuroprotective properties of GcMAF that we have recently described ,  are mimicked by chondroitin sulfate . Such a plethora of actual and potential therapeutic effects of chondroitin sulfate is widely recognized by the medical scientific community. The Mayo Clinic of the United States of America, for example, states that there is strong scientific evidence for the clinical use of chondroitin sulfate in osteoarthritis. In conditions as diverse as coronary artery disease, psoriasis, muscle soreness or interstitial cystitis, the web site of the Mayo Clinic reports that there are clinical studies supporting its use, although further studies need to be performed. However, most interesting is the list of the uses for chondroitin sulfate based on tradition or scientific theories reported by the Mayo Clinic. Such a list encompasses: “aging, allergies, Alzheimer’s disease, amyotrophic lateral sclerosis, antioxidant, antiviral, blood clots, bone healing, breast cancer, burns, cervical disc disease, chest pain, chronic venous ulcers, clogged arteries, colorectal cancer, diabetes, gout, gum disease, headaches, heart attack prevention, heart diseaseprevention, HIV/AIDS, hyperglycemia, high cholesterol, inflammation, inflammatory bowel disease, joint problems, kidney stones, leukemia, lung cancer, malaria, mouth and throat infections, multiple sclerosis, nerve damage, nerve regeneration, neuroblastoma, osteoporosis, pain, Parkinson’s disease, premature birth prevention, quality of life (osteoarthritis), rheumatoid arthritis, snoring, soft tissue injury, spinal cord injury, spine problems, surgery, systemic lupus erythematosus, temporomandibular joint disorder (TMJ), transplants, wound healing” . It is evident that such a diversity in the possible indications for the use of chondroitin sulfate implies effects at the most basic levels of system physiology, most likely at the level of the immune system. It can be hypothesized that the interaction between the Gc protein and chondroitin sulfate occurs both at the level of the plasma membrane, as demonstrated by DiMartino and Kew , as well as in serum, colostrum and milk. Thus, given the abundance of Gc protein and chondroitin sulfate in the same fraction of plasma, an interaction between the two circulating macromolecules appears almost certain and it is conceivable that such an interaction may confer novel biological properties to the complexes deriving from such an interaction. Consistent with this hypothesis, we demonstrated that when circulating sulfated glycosaminoglycans, in that case heparin, interact with plasma proteins, novel biological properties emerge from such an interaction, and these novel properties depend on the ratio and on the nature of the interaction between the macromolecules. For example, it is known that the effects of heparin on angiogenesis are controversial, with some studies claiming stimulatory and other studies claiming inhibitory effects. Since heparin in human plasma is complexed with basic peptides and proteins, we studied, in the chorioallantoic membrane assay, the angiogenic effect of complexes resulting by mixing poly-l-lysine (a basic heparin-binding polypeptide) with heparin. Our results demonstrated that the angiogenic effect of heparin was associated with the neutralization of its electric charges when the polysaccharide was complexed with a basic peptide . We observed qualitatively identical results when we purified, from human blood, neutral complexes formed by endogenous heparin and basic plasma proteins, thus lending credit to the hypothesis that interaction between heparin and certain plasma proteins led to the formation of multimolecular complexes endowed with biological activities that were not present neither in the isolated proteins, nor in the isolated glycosaminoglycan . Interestingly, not all the complexes between heparin and plasma proteins showed the same biological effects and, for example, only when the ratio poly-l-lysine and heparin was 20/1 (w/w), significant stimulation of angiogenesis occurred. Conversely, a ratio 1/1, that is a ratio that was not sufficient to neutralize all the negative charges on the heparin molecule, was ineffective . Since the chemical-physical characteristics of chondroitin sulfate are similar to those of heparin as far as the interactions with proteins are concerned, it can be hypothesized that specific interactions between the Gc protein and chondroitin sulfate may lead to the formation of multimolecular complexes endowed with properties different from those of the two types of macromolecules taken separately. Thus, it is conceivable that these multimolecular complexes exert the immunological effects that had been attributed to GcMAF. Furthermore, the complexes between the Gc protein and chondroitin sulfate may also be internalized and interact with the DNA of target cells. The rationale to propose such a mechanism of action lays in the recent observation that chondroitin sulfate favors the intracellular delivery of arginine-rich peptide-DNA complexes by coating the surface of these complexes through electrostatic interactions which improves their extracellular stability and subsequent cellular entry . The efficiency of chondroitin sulfate in enhancing the intracellular delivery of charged molecules is such that the addition of chondroitin sulfate appears to be a promising strategy to enhance the transfection efficiency of cationic arginine-rich peptides in multiple cell types . The possibility that chondroitin sulfate is internalized and conveys signals to the nucleus appears to be analogous to what we previously observed for heparin, thus further highlighting the analogies between the modes of action of these two glycosaminoglycans. Thus, more than thirty years ago, we and others demonstrated that heparin is internalized in different cell types, and internalization leads to a plethora of biological effects that are independent from its well known anticoagulant role , . It is conceivable that the biological effects of the multimolecular complexes between the Gc protein and chondroitin sulfate may be different according to whether the complexes remain on the cell surface or are internalized; this would explain the numerous and diverse effects reported for GcMAF and chondroitin sulfate. Chondroitin sulfate per se is responsible for all the biological effects attributed to GcMAF. Alternatively, it is the complex formed between the Gc protein (deglycosylated or not) and chondroitin sulfate that is responsible for the biological effects attributed to GcMAF. First, compare the effects of GcMAF extracted from human blood as described above , , , , with the effects of a GcMAF that is not extracted from human blood or other biological fluids so that there is no risk of contamination with chondroitin sulfate or other glycosaminoglycans. Such a “pure” GcMAF could be the one described by Bogani et al. in 2006 , or a GcMAF extracted and purified from human blood and exhaustively treated with enzymes to remove all possible contamination with glycosaminoglycans. Then, compare the biological effects of such a “pure” preparation of GcMAF with those of chondroitin sulfate and with those of complexes formed between purified Gc protein and chondroitin sulfate. A combination of the Gc protein, chondroitin sulfate, vitamin D3 and oleic acid. As far as the parameters to be studied are concerned, we propose to study the pattern of gene expression elicited by human blood-derived GcMAF in human macrophages as it was demonstrated by Siniscalco et al. . Such an experiment would demonstrate which molecule, or which combination of molecules among those quoted above, is responsible for such a pattern of gene expression. We show evidence supporting the hypothesis that a plasma glycosaminoglycan, chondroitin sulfate, may be responsible for the biological and clinical effects attributed to the GcMAF, a protein that is extracted from human blood. Thus, it is known that the precursor of GcMAF, the Gc protein, binds chondroitin sulfate on the cell surface and such an interaction may occur also in bodily fluids such as blood, colostrum and milk where both the Gc protein and chondroitin sulfate are present in relatively high amounts. This hypothesis would solve all the inconsistencies encountered in trying to explain the effects of GcMAF in vitro and in vivo and helps understanding the sometimes conflicting results independently observed by different research groups when administering GcMAF, extracted from human blood, to cell cultures, experimental animals or humans. According to our hypothesis, the Gc protein, whether deglycosylated or not, binds chondroitin sulfate both on the cell surface and in bodily fluids, and the resulting multimolecular complexes, under the form of oligomers trigger a transmembranesignal or, alternatively, are internalized and convey the signal directly to the nucleus thus eliciting the diverse biological effects observed for both GcMAF and chondroitin sulfate. The Authors are affiliated with the company “dr. reinwald healthcare”, a private company that organizes seminars and trainings for therapists and commercializes nutritional supplements and therapy devices. None of the products or devices distributed by the company is explicitly mentioned in this article and the Authors have not received financial compensation for writing this article.